A visit to one of the staples of Bluff Country, the Cannon River offers a variety of beautiful sights, including limestone cliffs, outcrops and a stunning old gristmill to end the trip. This is a very recommendable level. Using this map for reference, below 13′ is low and 16′ is high. Catch it between 13-16. Time: Put in at 12:15. Out at 2:50. Wildlife: Geese, turtles, hawks, heron and one deer. After seven years, Miles Paddled finally makes its way into Minnesota territory. And as an introduction to Minnesota, what could be better than a visit to Bluff Country? The Cannon River, not far from the cities and a designated Wild and Scenic River, was high on my list and it didn’t disappoint. Unlike Wisconsin, Minnesota requires a license if your kayak is over 10′. This is important to note if you plan on going because it can take a couple weeks to receive your permit if doing so by mail. You can also visit a DNR station in person but you’ll need to check the hours of operation. The license cost $24 but the upside is that it lasts for a couple years. You can, of course, just paddle a smaller boat though. Following Lynn and Robert Diebel’s lead in their Paddling Southern Minnesota guide, I selected “Cannon River I” as my destination but chose to shorten the route since I had to shuttle myself and from everything I could infer from scouting, I wasn’t missing much downstream. Plus, nearly 18 miles for a day trip is stretching the limits of a recommended day trip from my experience. I have to admit though, I was kind of intrigued by the idea of taking-out before the Malt-O-Meal dam in Northfield but the take-out in Dundas has its own highlight and makes for a more manageable 13.75-mile trip. 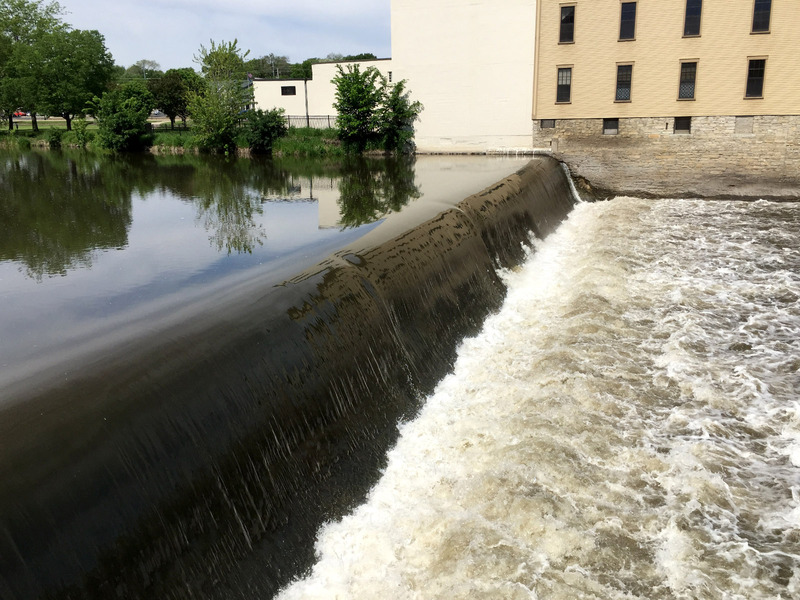 I did scout the dam and its impressive spillway because my wildest imagination had led me to believe that the Malt-O-Meal dam would actually not be made of traditional concrete but rather, a giant spoon. That was not the case though. The put-in at Two Rivers Park, at the confluence of the Straight River, is nothing special which was surprising since Minnesota really treasures and touts these rivers (and rightly so). It was a rock ditch landing/path which was hidden from the parking area. Coincidentally, it was there that I ran into the DNR which was leading some youngsters on a trip called I Can Paddle, which sounded like a cool outdoor program. Within the first mile you’ll come across some large rock walls – an exciting and welcome sight so early in the paddle. I was hoping it would be like this all day but that isn’t the case. You’ll find the handful of limestone cliffs and outcrops mostly within the first eight miles. The most impressive is found within the Cannon Wilderness State Natural Area which is a sheer limestone face jutting straight up from the water with a pile of crumbled rock at its base. Its pitted and pretty. The water of the Cannon is brown and muddy and I assume it’s mostly sand-bottomed but I could only catch a 1/2 a paddle blade of clarity so I’m just speculating based on the rare shallows and few sandbars I did see. I should note that this was also the second day in a row that I was met with faster than usual water levels. It wasn’t all that noticeable while paddling (if you told me these were normal levels, I’d believe you) but when all was said and done, I had yet again, averaged 6 mph instead of the normal 3-4 mph (I’m breaking kayaking speed records these days). I didn’t see a lot of wildlife but I encountered turtles, hawks and heron. At one point I was focused on a rock wall in front of me when a deer popped his head up from the tall grass not 10 feet from my boat and spooked the hell out of me. It’s often noted that snags are common on the Cannon. I had no trouble and there was no portaging on this day but there is countless high-water evidence along the way. Throughout you’ll find mounds of tree trunks and forcibly-produced piles of log debris. I imagine that navigation can change rapidly (no pun intended) in times after heavy rains and high water. The Cannon is about 100’ feet wide for most of the trip and despite the occasional proximity to Highway 3, it’s a mostly intimate and peaceful paddle. The first eight miles are the best for scenery, then comes four miles of straight-ish paddling in a much wider river. In fact, I’m not sure when it got wider – it just suddenly occurred to me somewhere near the outer boundaries of the State Natural Area, that it felt less intimate. The long, straight, open stretches outweigh anything scenic in the last leg until nearing Dundas. 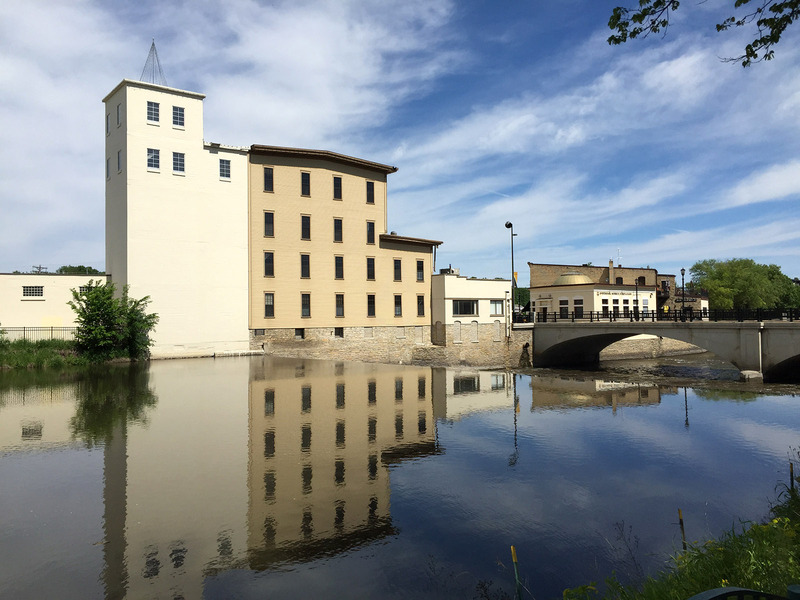 There, a few riffly areas greet you on the last mile and the paddle is punctuated by the shell of the historic Archibald Mill, a former gristmill, which at one time produced some of the best flour in the country. Just downstream a hundred yards or so is the take-out on river-right, just below the Highway 1 bridge. It’s sandy, grassy and marked but it’s hard to spot from the road where it looks more like a hiking trail entrance than vehicle-ready but there is a minimal amount of parking. Lynn and Robert point out that there is an alternate take-out at Memorial Park just upstream but the put-in/take-out is a muddy bank and you’ll miss running the riffles past the mill so I don’t recommend it. 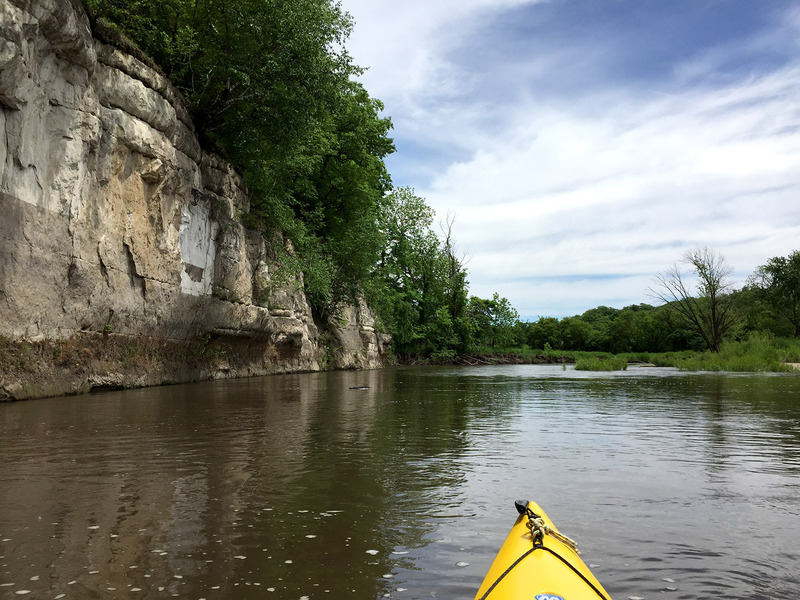 On my way to the next paddle, I chose Oxbow Park which is located on the South fork of the Zumbro River, the Zumbro, as it were, was my next destination. Located in the Zumbro Valley, the park is unique in that it hosts an actual zoo. The campsites were spacious, clean and the few campers that were there, were friendly. I enjoyed the company of deer walking through camp but not the raccoons, which seem to be taking over every state and county park in the midwest these days (I’m starting to think they’re planning a revolution). The bike shuttle – it was all highway travel due to construction on Acorn Trail (which would’ve saved some highway time). Thankfully, the shoulder was wide(r) but it’s always nerve-racking to bike the highway nonetheless. I’d absolutely visit again. The Cannon is a wonderful day trip with just enough scenery to keep the paddle interesting. There are no dramatic rapids and there are many stretches of flat, straight paddling so it’s perfect for beginner and intermediate paddlers. Of course, there are countless paddling opportunities in Minnesota for every skill level and every paddling wish-for, so the challenge becomes, how does one choose the next one? The bike shuttle was about 50 minutes and all on Highway 3 due to construction but when Acorn Trail reopens, I would recommend that for safety. The put-in at Two Rivers Park in Faribault. Immediately greeted by a handsome rock wall within the first mile. One of a handful of limestone walls on this stretch of the Cannon. The most impressive wall revealing itself. The size can really only be appreciated in person. Log piles are common features on the Cannon. Homes of Dundas reveal themselves on the last mile on the left bank. The bridge connects to Memorial Park. The take-out below the Highway 1 bridge. A view of the mill from above.